What will be the reason this time for oil prices to increase. Iran is the focus these days, even as the DOE inventories have show sustain gains over the past few weeks. So, we know that it is not the lack of oil that is driving up prices. Perhaps it is the global growth story that has many traders betting on the fact that there will be a great demand on the way. Of course we would have to make the assumption that there was actually global growth for that argument to hold up. Anyway you want to look at it, the facts are the facts. 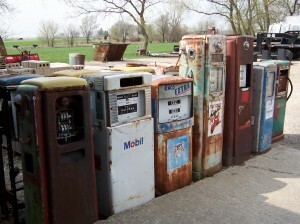 Less consumption of oil products are increasing invetories and the rules of supply and demand will eventually take hold. 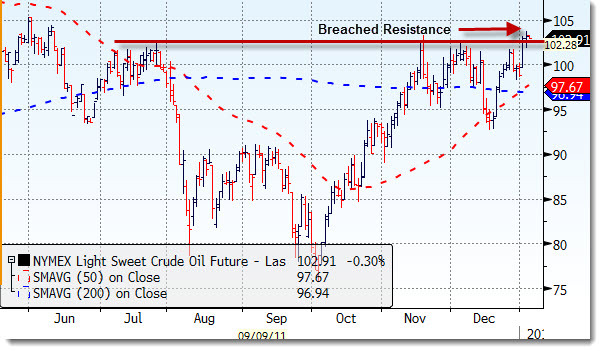 Either we will see demand pick up, or oil prices should drop. Of course if there is action taken by Iran to stop the flow of oil, or if there is any supply constraint imposed on the importing of Iranian oil to the U.S., we could be in for a real problem, right? Well, actually the fact is that the U.S. does not get a whole heck of a lot of oil from Iran anyway. This is nothing new as it has been determined that Iran’s interests are not aligned with ours. No matter, the headlines are enough to have the speculators all lathered up and ready with their buy tickets, even if the fundamentals are telling them to do just the opposite. By Barbara Powell Jan. 4 (Bloomberg) — U.S. gasoline demand sank 14 percent from the prior week to the lowest level in more than seven years of records, according to MasterCard Inc. Drivers bought 8.16 million barrels a day of gasoline in the week ended Dec. 30, down from 9.46 million the week before, according to MasterCard‘s SpendingPulse report. MasterCard‘s data goes back to July 2004. Fuel use fell below a year earlier for the 18th consecutive time last week, slipping 3 percent from 2010 levels. Fuel demand over the previous four weeks was 3.4 percent below a year earlier, the 41st consecutive decline in that measure. “We observed a noticeable week-to-week drop in gasoline consumption as many drivers were off the roads due to the holidays,” John Gamel , a gasoline analyst and director of economic analysis for SpendingPulse, said in the report. The week began on Christmas Eve. All seven geographical regions, as defined by MasterCard, saw demand slide by double digits last week.